Fiona wrote:"Hi Bill, Am back again with another cats & greens question. I just got an indoor palm tree but it didn't have an ID sticker so I don't know what kind it is. It's tall & frondy with dozens of skinny stalks - quite pretty. I have it on a tall box in a corner behind the stereo and didn't think the cats would go on the stereo 'cause they haven't yet. Plants at home are new for me since I haven't had windows before now, to grow them in. So as I can, I am getting greens for home. The hot/dry summers will, I suppose, have something to do with what can survive - but green is beautiful to look at... Although my ficus aren't doing really great. I appreciate your help. You do nice things for people. thanks!! 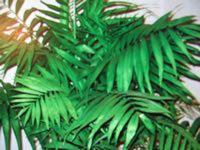 fiona"
Hi again Fiona, My guess is that you have a Parlor Palm, Chamaedorea elegans. To the best of my knowledge Parlor Palms not toxic to animals. Parlor Palms are slow growing house plants that should be grown in a warm (75°-85°) area of your house that has bright, indirect light. Indoor Palm Trees should be planted in a good commercial potting soil with some course builders sand added for better drainage. The soil should be kept evenly moist. so you might want to mist it daily when the air is very dry. Feed your palm monthly in the spring and summer with an all purpose 10-10-10 liquid fertilizer.